BEDDING SALESMAN AND internet sensation Mattress Mick has been ordered to pay €900 for unwittingly renting out a taxi to a driver with an expired public service vehicle licence. Prosecuted by the National Transport Authority (NTA) under his real name, Michael Flynn, the 65-year-old was summonsed to appear at Dublin District Court on Monday. Mr Flynn of Kincora Road, Dublin 3, pleaded guilty to not keeping a record of the driver’s licence but was given a chance to avoid a criminal conviction. Judge John O’Neill was told that during a compliance check a taxi was stopped in Stillorgan in Dublin on 8 March last. It took off at speed but the driver’s home was later placed under surveillance. When questioned the man admitted he had been the driver and his public service vehicle (PSV) licence had expired in January 2015. He had rented the taxi from Flynn who was later interviewed by an NTA inspector. Mr Flynn, who represented himself, explained to the judge that he had not known the driver who had rented taxi from him did not have a PSV licence at the time. He also said he had paid for the man to get one reissued and the driver does not rent the taxi from him any more. Judge O’Neill noted his explanation and ordered him to donate €500 to the Simon Community and to pay €400 in prosecution costs. Adjourning the case, Judge O’Neill indicated that Flynn will be spared a court conviction if the sums have been paid ahead of the next hearing in December. Flynn has become a fixture on north-side Dublin billboards. 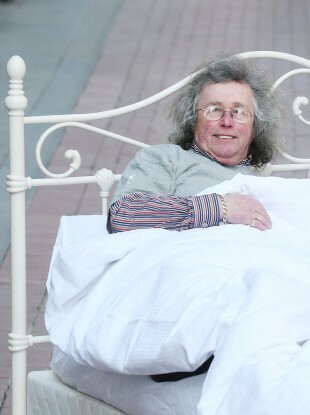 However, he is better known as Mattress Mick to fans of his cult comedy advertising and videos which went viral boosting sales in his mattress shop in Dublin. Email “Mattress Mick ordered to pay up €900 over unlicensed taxi driver”. Feedback on “Mattress Mick ordered to pay up €900 over unlicensed taxi driver”.